Nvidia gave us a glimpse of their next-generation Parker SoC back at CES 2016 when they announced the Drive PX 2, a powerful processing board for autonomous vehicles. Now the company has revealed more information about the ARM-based SoC, and where it will be seen in the market. Parker succeeds Tegra X1, ditching the octa-core CPU design for a six-core setup that includes two second-gen Denver CPU cores plus four ARM Cortex-A57s. Nvidia claims through vague performance metrics that this SoC "delivers 50 to 100 percent higher multi-core CPU performance than other mobile processors," with rated performance of 1.5 TFLOPs. As for the GPU, Parker still packs the same 256 CUDA cores as its predecessor, although these cores have received an architectural upgrade from Maxwell to Pascal. There's also a 128-bit LPDDR4 memory interface with ECC support, HEVC and VP9 encode/decode support at up to 4K 60FPS, and support for three 4K 60 Hz displays connected to the SoC. Clock speeds for the CPU and GPU are unknown, although we expect them to be higher than a typical ARM SoC as the target market for these chips – autonomous vehicles and processing boards like the Drive PX 2 – don't have the same power and thermal limitations as a smartphone or tablet. While Parker will be available for hardware partners to use in any way they like, Nvidia has integrated up to two of them into their Drive PX 2 board. 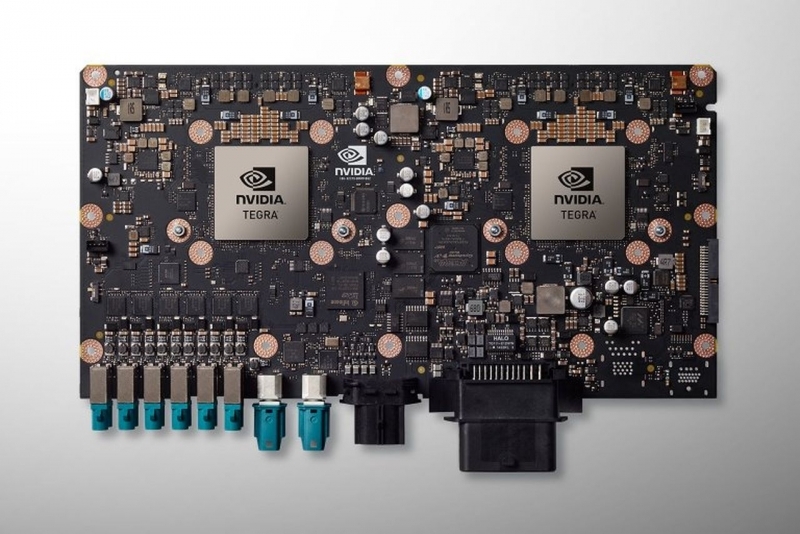 This processing board also includes two Pascal discrete GPUs for up to 8 TFLOPs of compute performance, which is needed to crunch the incredible amount of data produced from autonomous car sensors. Parker supports hardware-based virtualization, allowing up to eight virtual machines to be run on the one SoC, which is key in a vehicle that may require multiple systems like navigation, infotainment, and instrument clusters. Car makers can choose to use a complex Parker-based processing board like the Drive PX 2 for maximum performance, or simply integrate a single SoC in an efficient solution. Nvidia hasn't specifically said when we'll see Parker SoCs on the market, but the Drive PX 2 was originally expected to become available in Q4 2016.